For Christmas I decided I wanted to buy myself something special for Me!! 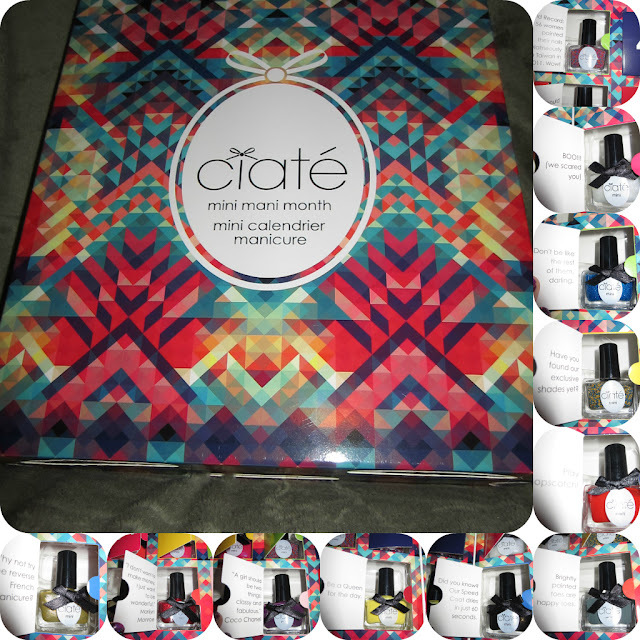 I decided on purchasing the Mini Mani Month set from Ciaté because it included so much for so little .this wonderful set includes 17!!!! Mini polishes from Ciaté and 4 mini caviar bottles and a funnel for only 64$ !! Holy crap that's a great deal since that's a whole lotta nail art ideas!!! The kit was held up until the New Year due to the Holidays but I am very Happy to now have my wonderful set. I am so very Happy to say that I used this set for the very first time the other night and I must say Great job Ciaté !! Kudos to you for putting out an outstanding polish set . 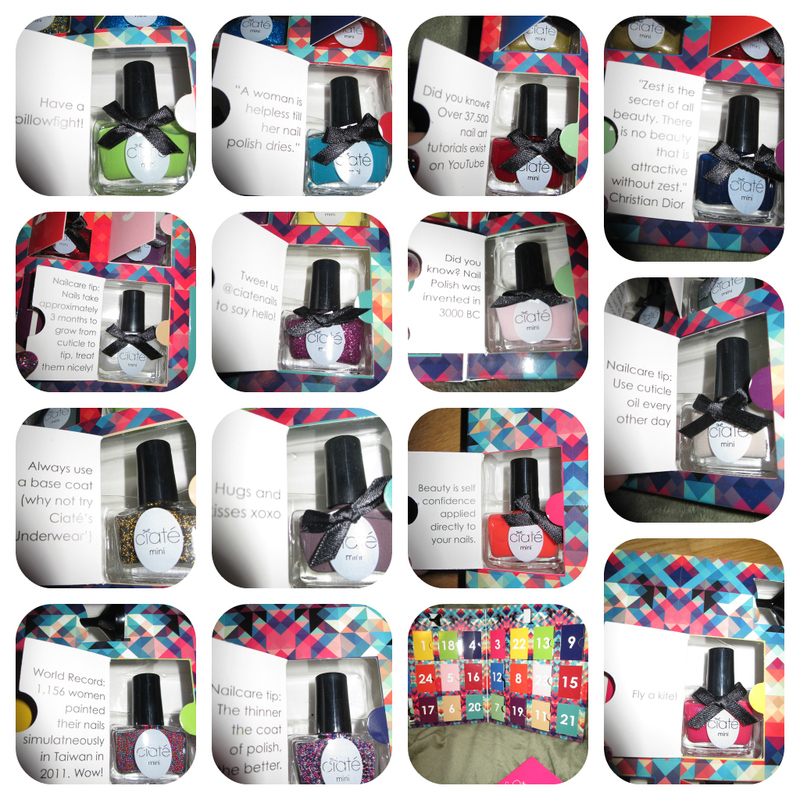 With so many colour in this box it is sure to give any Nail Junkie their Nail Fix for the year! Cupcake Queen - A stunning Fuchsia that his a shimmery glow to it. Angel Wings - a pearly white sheen that makes you think of heaven . Cutie Pie- is a very soft pink that would be great for that afternoon tea. LadyLike Luxe - almost an antique Gold. Big Yellow Taxi- This colour reminds me of the old school New York Taxi's . Mistress-Now this is your Classic red lipstick in a Nail Polish I LOOOOOVE this colour such a classic. Dangerous Affair- Is a very DEEP dark red ....It kind of makes you feel as if you are being naughty..
Cabaret-This kind of makes me think of Burlesque it's a very deep rich purple. Cookies and Cream-A very muted pinkish grey I think this would be very work friendly. Halo-This is one of my favorites It's a white sheen with Purple,Blue , And Green reflects . Headliner-A Turquoise that looks like it would be great for a day at the beach!. Speed Dial - A coraly Orange for some reason this colour reminds me of the 90's. Mojito-Now I am in love with this colour !! I feel as if I have little Mojito's on my fingers and makes me crave this yummy drink! Vintage-Is almost a Blueish Grey, It kind of makes me sad. Now this kit also included Three New Polishes that were only in this set!!!!!! Magic Carpet-Purple Berry Glitter Reflects !!! Hi Helen thanks for stopping by!! I did post a collage of photos in the posting.....and they still have this for sale at the shopping channel and you can do multiple payments if the price upfront is a bit too much. Sosososososo cute!! :) I totally want this..but I'm kind of obsessed with getting the big bottles. I really love Ciate. They have some really cool colours. I think you got a great deal! I too thought that they would be very small but when i got them i was shocked to see that they are not as small as I thought . The colours are just amazing!!! I find it so very overwhelming when it comes to this set because there are so many to choose from . The brushes aren't too bad ...I know some people have had bad luck with this set and some of the brushes being bunk but I only had one brush messed up and it's a colour I prolly won't use very often. and in all reality I could contact the company and prolly get them to send a replacement brush but I wont bother.